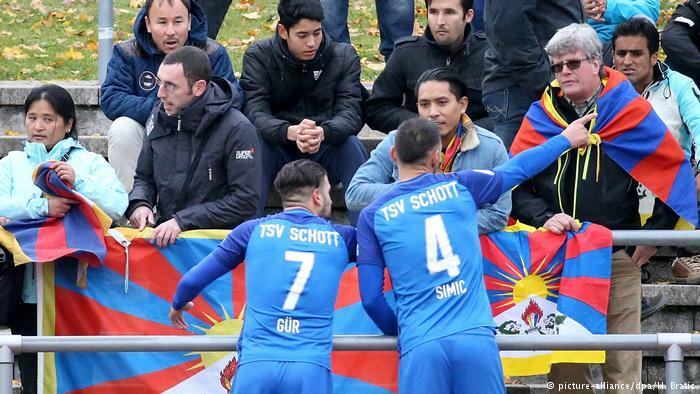 (TibetanReview.net, Nov23, 2017) – The Chinese under-20 national team’s next friendly match in Germany, against Regionalliga Südwest side FSV Frankfurt on Nov 25, remains doubtful, given the fact that fans have made clear their intention to hang up a Tibetan flag again, according to dw.com/en and other news reports Nov 21. The Chinese stormed out of the first match, played against Schott Mainz in Mainz on Nov 18, over a similar incident. The Mainz match was delayed for almost half an hour when the Chinese under-20 team walked off the pitch in the 23rd minute, after a small group of protesters unfurled Tibetan flags in the stands. The game only resumed after the protesters voluntarily rolled up the flag and the Chinese players returned to the pitch. China has made it clear, following that incident, that any display of Tibetan flag during the matches was unacceptable. “We are firmly opposed to any country or any individual offering support to separatist, anti-China and terrorist activities or activities defending Tibet independence, in any form or under any pretext,” China’s Foreign Ministry spokesman Lu Kang had told reporters at a Nov 20 press briefing. Ronny Zimmermann, vice president of the German football association (DFB), which is organizing the fourth division league matches, has said he planned to hold talks with the Chinese delegation in an effort to smooth things over ahead of the Nov 25 match. He too has insisted, however, that due to the right to freedom of expression, which is enshrined in Germany’s Basic Law, banning any such protests was out of the question. “As a guest, you should be able to handle it calmly and stand above such actions,” Zimmermann has said, referring to the Chinese team’s protest walkout during the Nov 18 match against Schott Mainz. And the still-angry managing director of Schott Mainz, Till Pleuger, has demanded that the DFB either come up with a compromise or call off the whole arrangement. “The DFB needs to sit down with the Chinese and find an amicable solution. If that’s not possible, then it is in everybody’s interest to call the whole thing off,” Pleuger was reported to have told the newspaper Die Welt. The dw.com/en report said the DFB’s plan to allow China’s under-20s to play friendly matches against members of the Regionalliga Südwest was controversial from the start. Under the plan, each of the 19 German teams is to receive a payment of €15,000 ($17,600). Despite the lure of the funds in a league in which money tends to be tight, three teams – Waldhof Mannhein, the Stuttgart Kickers, and TuS Koblenz – refused to go along with the plan, the report added. As a result, friendly marches have been scheduled only with each of the remaining 16 teams. Angela Merkel’s German government had signed a five-year football partnership agreement with China’s vice-premier Liu Yandong last November. But the under-20 project has now become a diplomatic headache. Liu was previously China’s top official on Tibetan affairs.